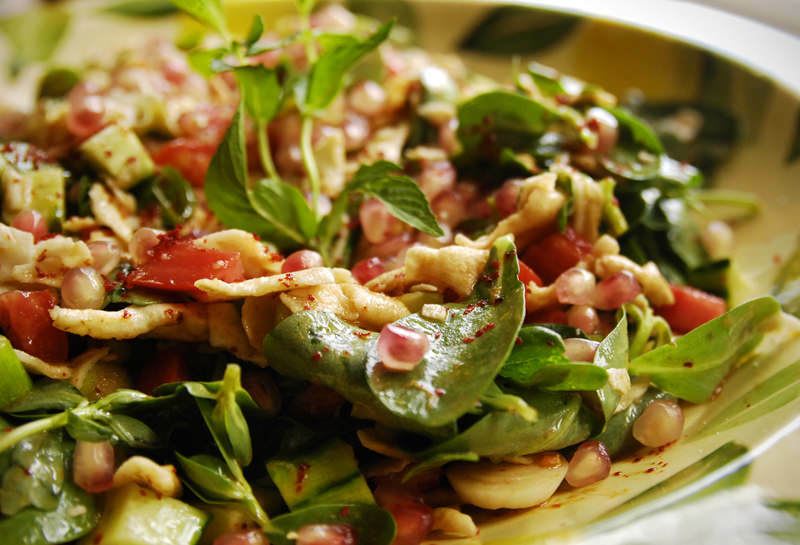 A real country salad - Lebanese style. A must when garlic and vegetables are at their peak. Separate the pitas and toast them on a grill or in the oven until they are dry and well toasted. Shred the bread in small pieces into a large bowl. Cover with cold water for 5 seconds and drain. Pound garlic in a mortar with salt into a fine puree. Add pomegranate molasses, oil and mint. Pour into a bowl. Season to taste with Aleppo pepper. Mix well and let rest for ten minutes before serving. Garnish with pepper and pomegranate seeds (optional).